Legal Writers: Does My Business Contract Protect Intellectual Property? The answer to this question is based on the nature of the relationship between the contracting entities. General publication laws give the copyright ownership of published intellectual property to the publisher. The general test is determining who is the actual publisher. Ghost writers always relinquish any claim to intellectual property rights when they accept a writing project unless a business contract details ownership of the property. A byline credit is not always sufficient, as all traditional newspaper reporters understand very well. Do not leave anything to interpretation where there is an opportunity for clarity, especially if it involves cash flow. This is the actual purpose of a business contract, whether the contract is for writing or any other service. The author should understand his legal claim to any piece of work he has created. Many times it is not practical or acceptable for a writer to own the copyrights to the publication. Most claims to a copyright are done for financial reasons, but not necessarily. Some legal writers create generic copy on a particular subject and then sell the copy to multiple publishers such as blog managers. This is normally not legal and can create problems for all parties involved. Make sure the purchaser knows this and always stipulate it in all writing contracts. Implied oral contracts can be enforceable also, usually for amounts under $500. There is no substitute for clarity in an effective working business contract. Writers wanting to retain rights to their intellectual property should discuss the conditions with the other contracting agents. Some writers only authorize one publication per purchase, but this is not always the norm. It depends on what conditions the purchaser or the writer will accept or the actual message in the composition. In some legal situations, such as defamation and libel, the owner of the intellectual property may be determined as the responsible party. Always remember that there is a legal responsibility component to copyright ownership of published material. 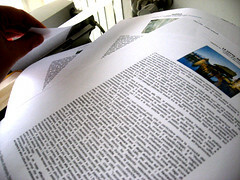 Most long-term business writing arrangements result in books or other hard-copy publications such as magazines. These compositions routinely require solid legal foundations and agreements on the part of all participating contracting agents. Ideally, each contracting agent will have legal counsel when creating compositions that could possibly generate significant earnings for all parties included. The emergence of the Internet and the contemporary informational age is making a solid impact on short-term writing agreements. Most agreements are generally informal and based on the relationships between the content creator and the content publisher. Every entity that operates a blog is effectively a digital publisher. This is clearly an area of the economy that is ripe for growth in terms of private business and legal writing agreements, but the growth of the industry will validate the need for more contractual stipulation. Inevitably, at some point in your career, you will encounter a contract dispute. If, for whatever reason, you are unable to come to agreement with the other party, it is in your best interest to contact an attorney who specializes in the field of business contract compliance and dispute resolution. According to our construction lawyer in New York who practices all aspects of business contract law, suggests that an attorney can help you understand what part of your contract has been violated, if anything has been omitted, and can help you recover any financial loss or damages you may have experienced as a result. Creator ownership of published material is practical in some cases, but content like legal advice should be accepted and published by a professional. Even in short-term writing agreements that are often like writing in the sand for fresh content providers, it is still important to understand the possible legal ramifications any business relationships may include. Any writer considering a professional career in webpage content generation should also research the most appropriate conditions for publication of their content and the actual need for ownership. Ultimately, knowing your rights and having a clear, concise contract in place is the best way to protect your intellectual property. Karla M. Somers is a writer with a master’s certificate in conflict resolution. She contributes articles to Canfield, Madden and Ruggiero, a construction lawyer in New York who has been interpreting business contracts and mediating disputes for more than 30 years. This experienced and trusted law firm understands the obligations that contractual parties each have to a project, as well as the remedies available when those obligations have not met. Previous post: Who Has the Right to Profit From Famous Antique Art?